Good morning Junkies! I have another journal page for you today. I saw Let's Face It 4 and knew I had to do something special with it. I started with a page out of my excess paint journal (what I call my journal where all the excess stuff that's on my craft mat ends up). It was created with Art Anthology Tango, and Mardi Gras Velvet (added at different times), the Art Anthology Inspired Grunge stencil and Mud texture paste, and was then sprayed with Art Anthology Glorious and swiped with Orchid Velvet to fill in the white spaces. 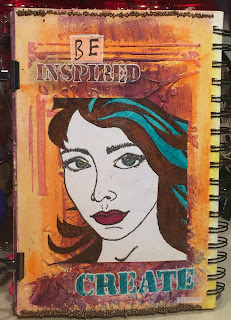 I stamped Let's Face It 4 onto a piece of mixed media paper and then painted her with Art Anthology Sorbets in Knyan Copper, Viridian, Red Velvet, and Evergreen. Her face was painted with a mixed of Art Anthology Cotton and Portobello Velvet. I outlined "Inspired" with a white pen, stenciled "Create" using the Art Anthology Soliloquy stencil with some Mud texture paste, then painted the words with Art Anthology Viridian Sorbet. Finally, I outlined "Create" with a white pen and added "BE" above the "Inspired" using the Almano Alphabet stamp set. For the finishing touch, I laid down a line of clear-drying glue on the top and bottom of the page and then sprinkled on Express-O Yourself Prills. I hope you enjoyed this journal page.